Pumpkin Patch Primitives is an online shoppe catering to Primitive Lovers and quilters who are looking for fast and easy projects to complete in this lifetime. 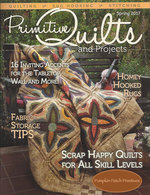 All patterns and kits are easy enough for Beginners and great fun for even the most experienced quilters. You'll find a large selection of Flannels, wonderful Red Rooster Fabrics, woolens and reproductions; along with many basics and homespuns to round out your fabric stash. You'll also find a great selection of Needful Things to warm your heart and home. Take your time and browse around... you'll be sure to find a little something that will make your heart happy!